Coventry God Cakes, as the name implies, are peculiar to Coventry. In Suffolk a similar pastry is called a ‘God's Kitchel’. Both pastries were presented at the beginning of the year by Godparents to their Godchildren along with a blessing for the year ahead. Dating back to at least the 14th Century these pastries even got a mention by Chaucer in The Sompnour's Tale (Godde's Kichels). Triangular in shape and similar to the jam and apple puffs you can buy today, these have a mincemeat filling. So a good excuse to use up the Christmas leftovers perhaps? The three sides are said to represent the holy trinity, an idea reinforced by the three cuts in the top. It is believed that the wealthier the Godparent, the bigger the cake! These pastries were also sometimes used in the same vein at Easter. On a floured surface, roll out the puff pastry thinly. Cut into 4 inch (10cm) squares and cut each square on the diagonal to produce two triangles. 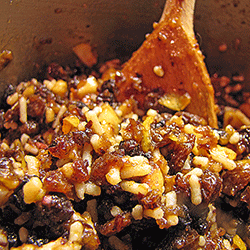 Mix the mincemeat with the rum or brandy (if using). Place a small spoonful of mincemeat on to a triangle (don’t overfill or the pastry will become soggy during cooking). Moisten the edges of the triangle with a little water, cover with another triangle and press the edges firmly to seal. Brush the top of each triangle with the beaten egg white, sprinkle with caster sugar and make three slits in the top. Place on a greased baking sheet and bake for 15 mins or until well risen and golden. Cool on a wire rack and eat as fresh as possible.